Aw! Thank you so much for your kind words! Thank you so much for the nomination, Murees, and I do hope your writing is going well and that you are happy. Do you mean the new BBC or CBS Sherlock Holmes series? I'm a fan of both of them, for different reasons. Thank you for thinking of me, Murees! That is so sweet! I'm a sunshiny-person... I LOVE the sun! You can check out my "sunshine-post" over at my blog! I don't know what's happening with Blogger...? Thank you, Murees. I'll be back to gather this lovely award on Friday. Congratulations on your award, Murees! Annalisa - It is completely fine. Sarah - You are welcome. You deserve them. Jai - You are so welcome. I think you really deserve it. Carole - Thank you. I am not doing much writing, but I hope to get back into the swing of things really soon. The Golden Eagle - Thank you. I saw the BBC one and really liked it. Sherlock is so mean in there that you just have to love him. Adhi Das - Thank you! 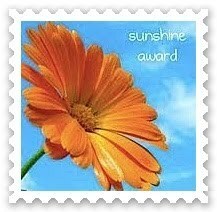 You remind me of sunshine, which is why I nominated you. You are always so kind and cheerful. Michelle - You are a sunshine person! You always cheer me up and you are just great. LD Masterson - You are so welcome. Congratulations on the award Murees and thank you for nominating me! Rebecca - You are so welcome!